When Hurricane Andrew rolled ashore in South Florida back in 1992, it destroyed $27 billion worth of property. The storm was the third most destructive to ever hit the US, an outcome due in part to the insufficient building codes of the time. Structures simply weren't built to withstand the storm's fury. These days, Florida ensures that new construction can stand up to the next Andrew by torture-testing building materials against a massive Wall of Wind. The $8 million Wall of Wind (WoW) facility, developed at Florida International University's International Hurricane Research Center (IHRC), was funded by a coalition of public and private sector entities. 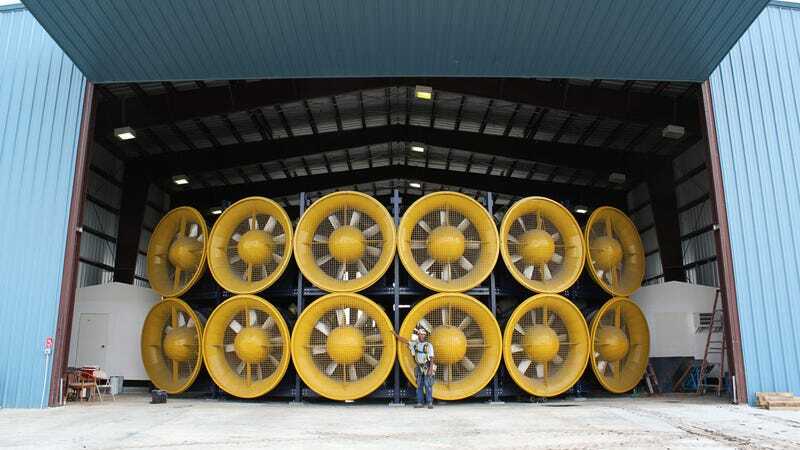 Standing 15 feet tall and 20 feet wide, its array of a dozen 6-foot 700HP fans generates sustained wind speeds of 157 MPH. It moves more than 3 million cubic feet of air every minute—that's the equivalent of a Category 5 storm. It accurately mimics wind turbulence via a unique flow management device, and recreates driving rains through an ingenious water-injection system. The current design is the result of five years of research by the FIU IHRC. The first prototype, built in 2007 by FIU's Department of Civil and Environmental Engineering, achieved wind speeds of 120MPH using a two fan design. The next iteration, a stationary six-fan block built by RenaissanceRe, was big enough to envelop a full-scale single-story home mock up. "Our Wall of Wind is the only university research facility in the world that generates Category 5-level wind speeds," Amir Mirmiran, the dean of FIU Engineering, told NBC Miami.